John Taylor has been the consummate session musician even with a decent amount of albums as leader. He had an ongoing group with trumpeter, Kenny Wheller and vocalist, Norma Winstone as Azimuth (not the Brazilian group if you've heard of them) and worked on countless other albums. But it is Rosslyn (ECM) that I find one his finest. It is a beautiful, quiet, walking masterpiece in the Bill Evans or Keith Jarrett tradition. 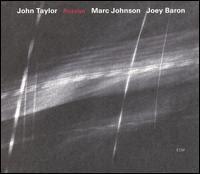 Rosslyn is a true trio album (Marc Johnson, bass; Joey Baron, drums) meaning it doesn't feel like there is a leader. This is a team effort that blends wonderfully from piece to piece. It's hard to believe all this happening when John Taylor was 61 at the time. This is the perfect album to end your day with no matter how good or bad it was. A thoughtful and effortless work that I find something special in with every spin. Not sure if this is an actual video or something someone put together but it works well with the title track. This album is probably the only one you will find at an actual record store so I highly recommend you buy it. Most of his other albums including Rosslyn are available online and for download.